At a large university like RIT, there are many ways to get involved. 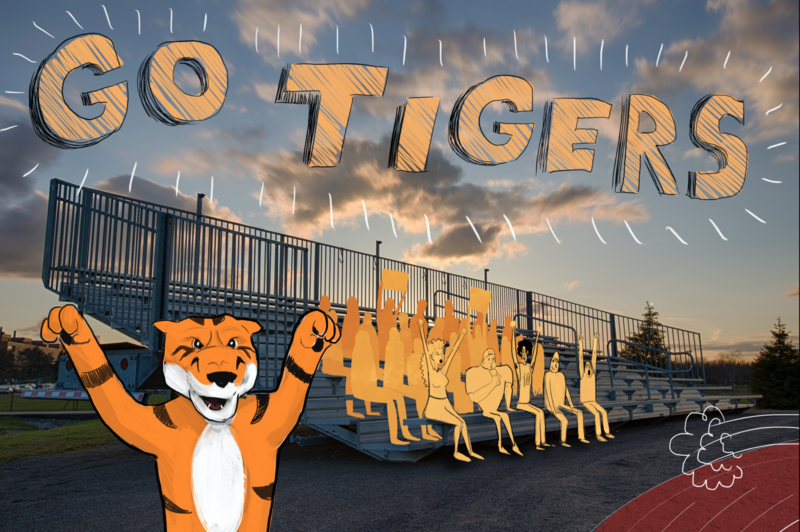 One of the best ways to get engaged on campus is by attending a sporting event bursting with Tiger pride. "Athletics are a great source of spirit here on campus," said Athletic Director Lou Spiotti. "And we really have a program to be proud of." During his last 36 years as Athletic Chair, Spiotti has built a competitive, nationally recognized, multi-division athletic program. “We have 22 sports that abide by NCAA Division III rules, and then Division I men’s and women’s hockey,” he explained. Just this past year, RIT Athletics had enormously successful seasons, shattering many school records. The women’s cross-country team was nationally ranked and made it to the NCAA championships for the first time in program history. The men’s hockey team won the Atlantic League title and made it to the NCAA tournament for the second consecutive year. The women’s basketball team was ranked nationally for the first time ever and competed in the Liberty League championship. The men’s indoor track team had a stellar season, winning the Liberty League Championship. Women’s soccer was also nationally ranked and competed for the Liberty League Title. Here is a closer look at the men's soccer and women's volleyball teams. According to Head Coach Bill Garno, the upcoming season promises to be a very exciting one for men’s soccer. The team overcame numerous obstacles last year to finish a strong fourth in the Liberty League, and they plan on defying just as many expectations in 2016. “Performance-wise, we had our youngest team ever last season,” explained Coach Garno. Moving forward, Garno expects the disciplined players to excel. Many of his young players had to step into leadership positions very early on in their collegiate careers. “I didn’t expect to come in and have as much of an impact as I did,” said Anthony Defeo, now a second year Diagnostic Medical Sonography major. His teammate, third year Liberal Arts major Gene Sicoli, felt similarly. “It was a big transition from high school to college soccer, physicality wise, but I really enjoyed it,” he said. Both men more than lived up to expectations, posting stellar seasons. Sicoli led the team with 9 goals and 4 assists, and Defeo scored the game winner in a nail-biter against King’s College. As this young team matures both physically and mentally, Garno says the school can expect to do very well in league play and beyond. The 2016 season presents an interesting change in dynamics for the women’s volleyball team. The women finished a respectable fourth in the Liberty Leagues last year, and have aspirations for taking home the Liberty League Championship in the future. A recently graduated Packaging Science major, Anna Valentine, encouraged students to attend the games. If volleyball and soccer aren't your thing, there are plenty of other sports here you can get excited about. Whatever your passion may be, you can find it at RIT.